Geology is the study and science of Earth’s land forms. This includes how they were created, have changed over time and how they will evolve. GEOLOGY – The study of physical features and the processes that act on their development. Even though, you can slice and dice geology in different ways…. here’s how we’ve divided the branches of geology. 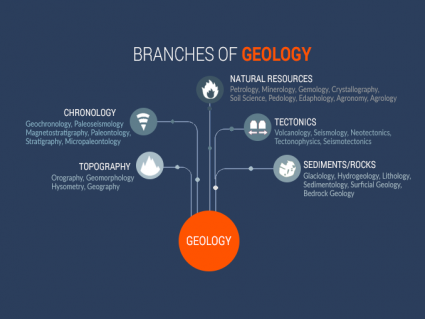 These branches of geology specifically deal with time. Whether it’s fossils, magnetic fields or types of landforms, they are often concerned with reconstructing the past. This is why “Paleo” is common in these fields of study. Paleo is short for ”paleolithic” which often refers to the geologic past. Stratigraphy is concerned with the layering of archaeological remains and their position on layers of rock. For example, magnetostratigraphy studies magnetic fields in rocks and past pole reversals. STRATIGRAPHY – How layering of rocks and strata are analyzed to measure geologic time. PALEONTOLOGY – How organisms evolve and their interactions in their environment by studying fossil records often found in rocks. MICROPALEONTOLOGY – How microfossils are characterized. PALEOMAGNETISM – How to reconstruct previous magnetic fields in rocks including the direction and intensity to explore pole reversals in different time periods (past and future). GEOMORPHOLOGY – How landforms, physical features and geological structures on Earth were created and evolved. PALEOSEISMOLOGY – How geologic sediments and rocks are used to infer past earthquakes. MAGNETOSTRATIGRAPHY – How sedimentary and volcanic sequences are dated by geophysically correlating samples of strata deposited with the Earth’s magnetic field polarity. GEOCHRONOLOGY – How old rocks and geological events are dated using signatures inherent in rocks. Seismology, volcanoes, earthquakes… these branches of geology all have one common theme. The underlying process that impacts them are plate tectonics. Fields like seismology measures how waves travel through and around Earth from earthquakes. Meanwhile, tectonophysics targets the physical process that act on the behavior of waves. As tectonics play a key role in volcanoes, volcanology explains how and where volcanoes and related phenomena (lava, magma) erupt and form (past and present). TECTONICS – How Earth’s crust evolves through time contributing to mountain building, old core continents (cratons) and earthquakes/volcanoes. VOLCANOLOGY – How and where volcanoes and related phenomena (lava, magma) erupt and form (past and present). SEISMOLOGY – How seismic waves travel through and around the Earth from earthquakes. NEOTECTONICS – How Earth’s crust deforms and has moved in recent and current time. TECTONOPHYSICS – How Earth’s crust and mantle deforms specific to its physical processes. SEISMOTECTONICS – How earthquakes, active tectonics and individual faults are related to seismic activity. Most geology careers involve the extraction of natural resources from the surface. This is where geologists relate rock types and landforms in a specific environment. For example, petrology uses mineralogy and rock types to understand geological formations from drilling. In addition, they study the chemical properties and how atoms are arranged. Soils are also considered a natural resource for agriculture production. Agronomy, edaphology and pomology are specific to soil science and how food grows or is cultivated. PETROLOGY – How types of rocks (igneous, metamorphic, and sedimentary petrology) form in their specific environment. MINERALOGY – How chemical and crystalline structures in minerals are composed. GEMOLOGY – How natural and artificial gems are identified and evaluated. CRYSTALLOGRAPHY – How atoms are arranged and bonded in crystalline solids. SOIL SCIENCES – How soils relate as a natural resource including their formation factors, classification, physical, chemical and fertility properties. PEDOLOGY – How soils are classified based on their biological, physical and chemical properties. EDAPHOLOGY – How soils influence plant growth and living things. AGRONOMY/AGROLOGY – How the field of agriculture involves science such as crop production, biotechnology and soil science. HYDROGEOLOGY – How groundwater is transported and is distributed in the soil, rock and Earth’s crust. POMOLOGY – How fruits grow and are cultivated. Sedimentology looks at the processes of how sediments deposit. For example, sedimentology is concerned with erosion, weathering, transportation and deposition of sediments. One of the processes that understands the erosion, movement and deposition of sediments is from glaciers. Specifically, glaciology studies glaciers and how they shape the landforms. Likewise, surficial geology examines sediments overlying bedrock such as during a glacial retreat. Finally, beneath the regolith is the intact, solid rock that bedrock geology is concerned with. SEDIMENTOLOGY – How sand, silt and clay are deposited and the processes that act on it. SURFICIAL GEOLOGY – How surface sediment (till, gravel, sand, clay, etc) overlying bedrock was formed such as during glacial retreat or in lakes associated in these periods. GLACIOLOGY – How ice and glacial deposits have reconstructed landforms as well as how existing (polar) glaciers behave and are distributed. GEOPHYSICS – How physical processes and properties relate to Earth and its surrounding space. BEDROCK GEOLOGY – How the intact, solid rock beneath surficial sediments formed including age (stratigraphic sequences), morphology and rock properties (folds, faults, fractures). LITHOLOGY – How rocks are classified based on their physical and chemical properties. Topography also plays an important in geology. Of all the branches of geology, topography examines the physical features that are distributed on the landscape. For example, orography focuses on topographic relief and how mountains are distributed. Without plate tectonics which is a focal point in geology, mountain building would have not taken place. Finally, hypsometry measures height and depth of physical features from mean sea level. Geologists use hypsometry to understand the profile of Earth and landscape evolution. OROGRAPHY – How topographic relief in mountains are distributed in nature. TOPOGRAPHY – How physical features (natural and artificial) are arranged on the landscape. HYPSOMETRY – How height and depth of physical features are measured land from mean sea level. When the Mars Rover started wheeling around the red planet, its crosshairs were targeting the rocks and geology of Mars. Specifically, it was getting close-up and personal of the composition of Mars. Astrogeology is very closely related to exogeology. They both focus on how geology relates to celestial bodies such as moons, asteroids, meteorites and comets. Lastly, selenography studies the physical features of the moon. For example, it understands and catalogs features such as lunar maria, craters and mountain ranges on the moon. ASTROGEOLOGY – How geology relates to celestial bodies like moons, asteroids, meteorites and comets. AREOLOGY – How geology is composed on Mars. SELENOGRAPHY – How physical features on the moon formed such as lunar maria, craters and mountain ranges. EXOGEOLOGY – How geology relates to celestial bodies like moons, asteroids, meteorites and comets.